The new model of the stoller the twins got for Xmas came out, so I went and exchanged it. I liked this one better cause of the color and design inside the canopy. The twins love it!! We use it to pick up Chonie from the bus stop. They look so big in it. 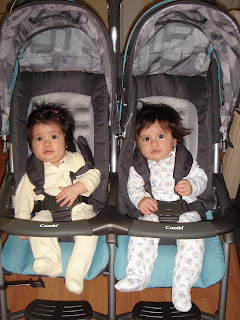 The twins say thanks for our new stroller Nana & Tata! !